Congratulations to Kim and Ava Fogle on their purchase of Doublejacneat. We are excited for Ava to start her reining career!! 2017 NRHA Top Ten Final World Standings, Sixth Place Youth 13 and Under! Third in the Limited Non Pro 2017 NRHA World Standings! Chapman Champions congratulates Amanda Yarbrough, riding Fight on State, for winning the Northeast Affiliate Regional Championships Open and Intermediate Open classes at the Dream Park, NJ! NRHA Northeast Affiliate Short Stirrup Champion! Chapman Champions Strike Again…Brianna Villegas, riding her mare Conquista Annie, is the NRHA Northeast Affiliate Short Stirrup Champion in her first year showing! 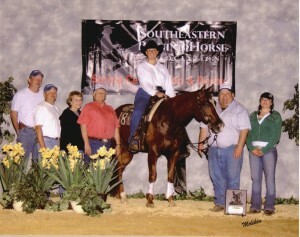 Chapman Reining Horses would like to welcome new trainer Emily Sgarrella! Starting her winning ways with the best! Welcome aboard!